I must apologize but I'm on a Game Boy kick and nothing can stop me. 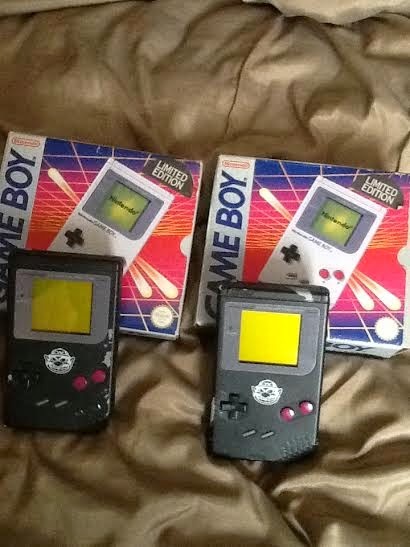 Recently I received an email from a reader who saw my article on 7 Rare Game Boys. Apparently she's had two of those black Wario Game Boys in her attic for the past 20 years! Turns out her two children won the Game Boys from a contest in The Sun, one of the UK's biggest tabloid magazines. The two Game Boys are pretty heavily-used and you can see the original paint under the black which leads me to believe that all these limited edition Game Boys were just painted over normal Game Boys. After talking to her for a while, she wishes to remain anonymous, she stated that she is going to hold on to them for a while before she decides to sell them. Sorry collectors, but we are all gonna have to miss out on this one. How do two people win in the same house.